Called around and are still having trouble finding a sign company that can handle your sign service needs in Houma Louisiana? You’ve come to the right place! Alternative Signs has several sign service crews ready to get to your sign, parking lot lighting, and area lighting in Houma, LA serviced today! Our crews are highly skilled in troubleshooting and repairing any type of sign, parking lot lighting, and area lighting. Our service trucks are fully stocked with DHO fluorescent lamps, metal halide bulbs, ballasts, power supplies, transformers and much more. Our service crews are ready to be dispatched to Houma in a moment’s notice. Our professional service crews and speedy turnaround will be sure to keep you happy and your sign and lighting working all year round. Alternative Signs employs the most elite sign installers in the industry. 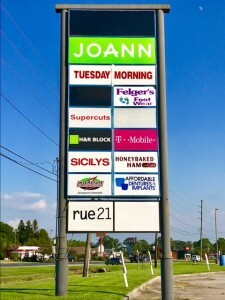 Our company has installed signs in Houma for several national retailers such as GameStop, Auntie Anne’s, FootLocker and Francesca’s. Most malls, such as Southland Mall, have very stringent insurance requirements. 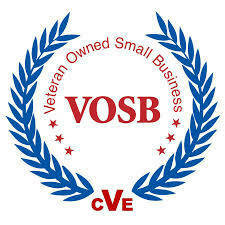 Alternative Signs works hard to stay compliant with all our clients and the local malls. We complete projects in Southland Mall in Houma Louisiana for many national retailers such as JC Penney, Children’s Place, Journeys, Maurice’s and many, many more. 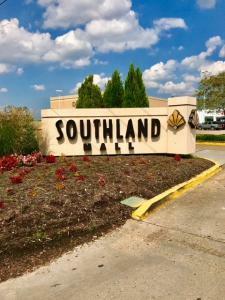 Our sign installers and sign service technicians work closely with Southland Mall’s management team and security team to ensure all requirements are met and all sign projects are done in a safe manner. Our highly skilled sign technicians and the capability to manufacture and install large industrial signs allow us to even cater to the large industrial clients in the Houma area such as Key Energy Services and K+B Industries. Our sign installers and sign service technicians are OSHA 10, CPR and First Aid certified; so, when you’re working on your next large industrial sign project, give us a call and we’d be happy to help! Alternative Signs holds a current sign contractor’s license and electrical contractor’s license in Houma, Terrebonne Parish and the state of Louisiana. We’ve worked closely with the City of Houma’s local government to pull permits for building, pylon and monument signs for large companies such as Toyota, Scion and Auto Zone. Alternative Signs’ established relationship with Terrebonne Parish allows our company to get in with your sign drawings and application and out with your sign and electrical permit a breeze. 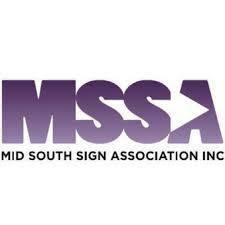 When opening your next business in Houma Louisiana, remember to call Alternative Signs for all your sign needs. Houma, Louisiana hosts several festivals throughout the year such as the Rougarou and Alligator Festivals. Local craft and food vendors come to Alternative Signs year after year to get their promotional signage. Call Alternative Signs and get your business recognized at the next great festival in Houma Louisiana.